He came, bought in all of his equipment and began cleaning. Carpeting was really dirty and I was extremely pleased at how clean it is now, almost new looking. Couldn't ask for a more personable and professional person."" I used ProCleanersNJ for carpet cleaning services. They were very good and excellent. They are actually come back next month. They have a very fair price and they were very professional. They did a great job. Pro Cleaners was my first experience with Angie's List, and I was thoroughly impressed. At the end of April I called to book an appointment and the young woman was pleasant and helpful. She was flexible and able to squeeze us in on a Saturday afternoon. My brother and I were cleaning up a rental unit in our four family house. There was a family of five with a dog that had been living in this apartment for 7 years. The carpet was a light brown and pretty well beat up. We considered new carpet but we had spent so much money on repairs and updating the kitchen and bathroom that there wasnt enough leftover. Chris from Pro Cleaners came to work his magic! He was so friendly and cheerful he made us feel at ease. We were still working on the kitchen when he came, so he worked around us. There were areas that the carpet had been badly stained and worn down. Chris spent extra time and used a specialized cleaner/spot remover to lift the marks out. He used a special deoderant and sanitizer to make sure the carpet was truly clean. We could tell Chris took extra time and care to ensure the job was completed to our satisfaction. He actually brought a dead carpet back to life! My brother and I were amazed at the difference. Since it was Chris' last job of the day, and we were so thrilled with the outcome, we asked if he could also clean the carpet on the staircase. This is an old house, so the staircase was very steep. Chris was super. He managed the whole staircase with his equipment by himself and without issue. I would absolutely recommend PRO CLEANERS to anyone. Chris is a true professional who takes pride in his work and a job well done. He went above and beyond to exceed our expectations! It turned out excellent, I would use them again without a question. They did it on a Sunday which was nice. There were slightly extra charges. They did a great, beautiful job. I would recommend them. This is the second time we have had Chris do a cleaning project. We have two Lane couches with built in recliners covered with microfiber velour fabric and a standalone Lane recliner covered with the same fabric in another color. These pieces have button backs with lots of folds and pleats. Not easy to clean. The other three chairs are covered on another type of fabric. When Chris finished the furniture cleaning, we could not believe how good they looked. Actually, they looked like new and the colors were so vivid. The carpet cleaning got rid of all the stains and "walking paths" worn in over the years. They also looked close to new. Chris spent lots of time getting into all the pleats of the button back pieces. This guy pays attention to detail and I was impressed by that. He did not rush through our job and spent a good 4 hours getting everything done perfectly. He even touched up part of the carpet in the area he cleaned several months ago and didn't charge me for it. How many guys would do that? I would definitely call him in the future. I moved out of my condo and was getting it ready to rent to a tenant. I saw the Big Deal for two rooms and a hallway and once I finished painting the walls called ProCleaners to set up an appointment. They fit me in two days later, showed up on time, and did a great job. They did such a good job that I'm a little disappointed that my tenant is getting a much cleaner condo than I ever had. I should have called them when I moved into the place. I'll definitely be calling them again to clean the carpets in my new house as soon as they aren't covered in piles of boxes. reliable and professional. will have them do it again every couple of months. Very professional, courteous and reliable. This carpet cleaning service was fabulous!!!!!! I have used other companies and none can compare. The guys took his time and treated my carpet and cleaned it so well it looked like new. Thank you Procleaners and I will definetly refer the company to friends and family and YES i will use them again. Very nice, professional people and great service. I didn't think my rugs were in bad shape until I saw how clean they could really be!. ProCleaners was great! They did an excellent job. I highly recommend them. I also sell real estate in NJ and will be referring them to my customers. Excellent job. Professional, courteous and rate a high 10! They were amazing! They were the only cleaners that could get my stains out. And so nice. Will use again and again. The service and the staff are fantastic. A quality job. The best carpet cleaning service I have ever had and I will be a repeat customer. They were the 3rd carpet cleaner that we used for our home in the last 6 years and they were clearly the best. I'll use them again. Everything was professional and topnotch, the guys that did the carpets were knowledgable and very eager to get the job done right. Would definitely do business again, and recommend to others!!!!! 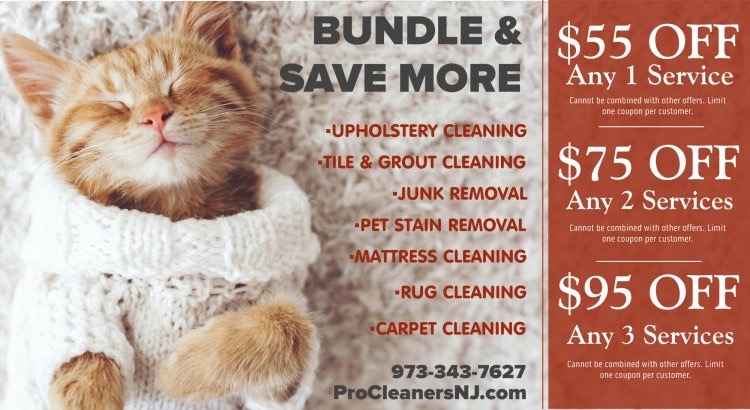 ProCleanersNJ cleaned the carpet in 2 upstairs bedrooms, the hallway, and the carpet in my family room. For the service and quality provided, this was a bargain. He arrived on time, provided the paid for service and was flexible enough to also clean the carpet in my family room. After the cleaning, the carpets in all the rooms looked brand new! I have 2 cats and the previous owners of my house had a dog....ProcleanersNJ made my carpets look virtually new! I would recommend them to any and all looking to have their carpets cleaned. I will next have my sofa and love seat cleaned by them. ProCleanersNJ did a good job. They were very nice and I recommend them. He said he was going to show up, if he's going to be late, he tells you and he stays until he's done. I thought he was very conscientious. I think it was probably a good price because my husband doesn't get anything unless it's a good price. I have a basement carpet and I'll use them again for it.